WARNING - THIS POST CONTAINS LANGUAGE SOME PEOPLE MAY FIND OFFENSIVE. If you are likely to be offended by the use of certain words, please do not read on. 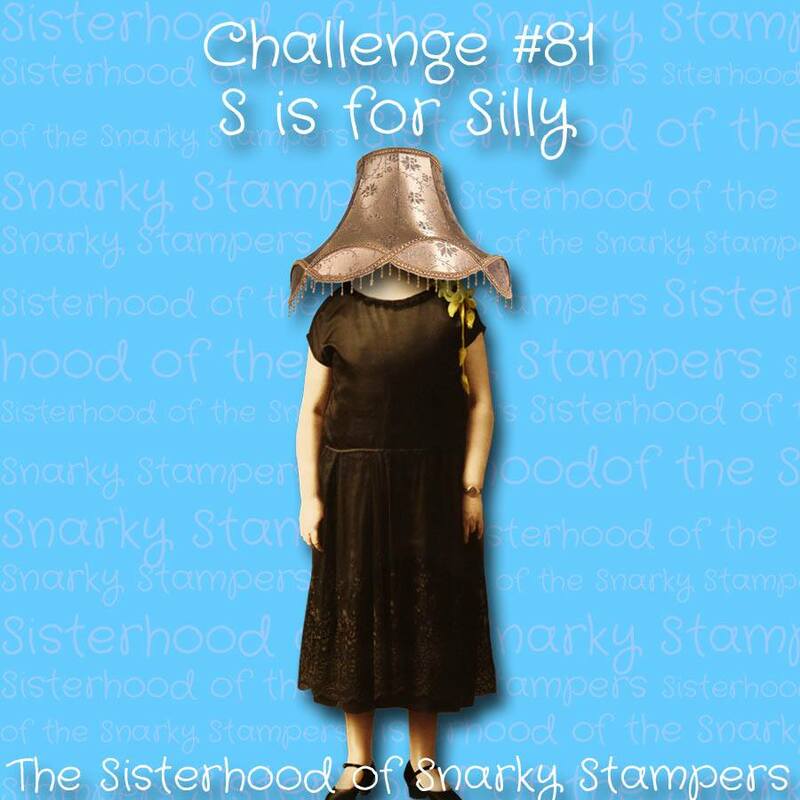 Today is April 1st - April Fool's day - so Edna thought it would be rather fun to have an April Fool related challenge at the Sisterhood of Snarky Stampers, where our theme is S is for Silly. My card doesn't look the least bit silly or April Fool-ish, does it? However, the snark is very carefully concealed. You see the Chinese characters? Well if you can read any Chinese, you will see that they sort-of say "Lucky fish". The little Cantonese I once knew is very rusty, so it's sort of pidgin Chinese, but it gets the message across in the same way as some of those t-shirts they make in Hong Kong that have random "Chinglish" sentences on them. (I once saw a man in a fairly smart HK restaurant wearing a t-shirt that said "The harder you pull, the harder it gets", it almost put me off my prawn balls, but I digress....) . Anyway, to make a long story even longer, Chinese tradition has three wise men, Fuk, Luk and Sau who represent luck and happiness, prosperity and longevity. And the first of my characters is the name of the first wise man, FUK. The second character is the character for fish, which in Cantonese (and I think Mandarin too) is pronounced YU. So if you read the characters out loud, they say FUK YU. So if you ever feel the urge to send somebody a card telling them that you absolutely hate them without actually saying it openly in English, or you just want to play a prank on a friend, this is the card for you. After all, who could ever be offended by the sentiment "Lucky fish"? Oh Jane you are naughty - but I do like you LOL! You made me smile this morning. We-ell, we have a few politicians of our own here in the UK I would like to send it to. Maybe I need to mass produce them! Muahhhhh ha ha ha ha ha this is ALL kinds of awesome sistah!!! Sneaky, brilliant, and oh so snarky! Love this! Haha I love it! Very clever. So classy, and so very snarky. Well done. That is too damn funny!!! To even get the idea of hiding the true message like that. I can't stop laughing!!! Brilliant!